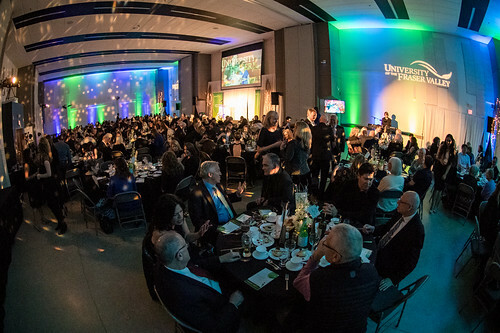 The University of the Fraser Valley welcomed supporters from the community to the Abbotsford campus on November 14 for Town and Gown, a fundraising dinner that celebrated the transformational power of a UFV education. Community guests mingled with UFV faculty members and student ambassadors, who shared stories about how their UFV experience changed their lives for the better. 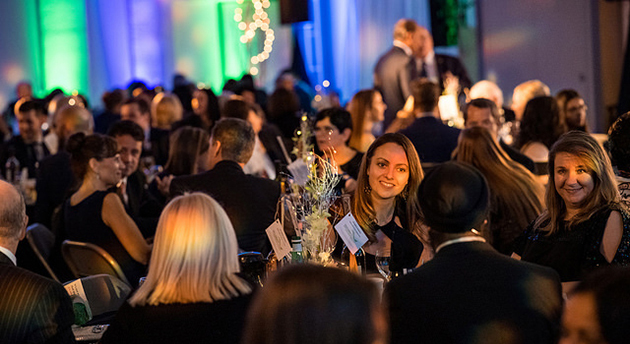 Proceeds from Town & Gown go to UFV’s Changing Lives, Building Community Endowment — supporting scholarships for students who demonstrate superior scholastic achievement, leadership, and commitment to the community. UFV President Joanne MacLean thanked the attendees for the role they play in changing lives and building community. “Our students are engaged in a chain reaction of transformation that does not stop when they graduate. For our students have learned to learn, and they will go out into the world and help to shape it. They become agents of transformation in our society. “Similarly, here tonight I see a room full of UFV supporters who are successful, hardworking folks who were transformed by their education, by their experiences, and by their choices. During the evening, UFV recognized its Distinguished Alumni award winners. Liz Harris (BA ’01), executive director of the Fraser Valley Health Care Foundation, was named Distinguished Alumni for her achievements in the field of professional fundraising. Andrew Alexander (BSc ’14) received the Young Distinguished Alumni award for his scientific research, which is focused on providing solutions to the global challenge of increasing antibiotic resistance. 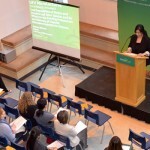 Student Gina Dhinsa, who is in the third year of her Bachelor of Global Studies degree program, spoke about how UFV is helping her achieve her dream of changing the world by working for equal education rights for girls in every country. 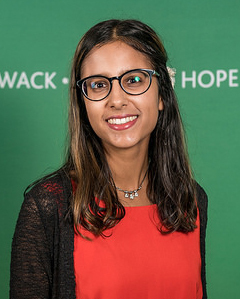 Dhinsa is currently volunteering with non-profit organizations and a youth council, and working for her local MP, and hopes to become a human rights lawyer. Her long-term goal: become Canada’s Minister of International Development. Social Work degree student Becky Smith shared her story, via a video, of overcoming alcohol addiction, starting at UFV at age 37, and working toward her credential so that she can help others. Donor Paul Esposito and his family were recognized by UFV Vice President External Craig Toews for their donation earlier this year of $1.125 million – the largest ever received by UFV. Guests were invited to purchase commemorative cedar paddles designed by UFV alumnus Xotxwes Jonny Williams and produced in-house at UFV’s Trades and Technology Centre. Prospera Credit Union was the presenting sponsor for Town and Gown. Platinum Sponsors were MNP and Quantum Properties. Gold sponsors were The Co-operators, Dana Hospitality, Minter Country Garden Store, and Stantec. Silver Sponsors were Aldergrove Credit Union, Chernoff Thompson Architects, Colliers Project Leaders, and Securigard. Bronze sponsors were Leaders International, Manulife Financial, Honeywell, and Coca- Cola. Media Sponsors were The Abbotsford News, The Chilliwack Progress and the Patrika newspaper.